I ordered a set of one-inch lowering springs from Performance Products and a set of Bilstein shocks. I made a trip to my Brothers shop in Bethesda and had him give me a hand with the installation. It is really nice to have access to a lift! 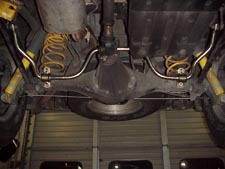 To replace the rear springs the vehicle has to be lifted with all of the weight off of the rear axle. 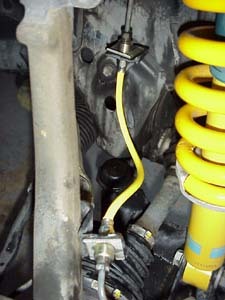 The shocks are removed and the rear sway bar is disconnected. This gives plenty of room to pull the rear springs out and install the new one. The new shocks are bolted in and the sway bar reconnected. Done with the rear. The front is a little more difficult. The stock shock/spring (AKA coil over) assemblies are removed and then a spring compressor must be used to disassemble the assembly. The top portion is reused on the new assembly. The new spring is placed on the new shock body then compressed to the point the top spring seat can be attached to the shock. Then the assembly drops into the vehicle. I then had the front end realigned. The set up dropped the vehicle about � of an inch. I think it would have been the full inch if the stock shocks were reused. The Bilstein have a higher gas rebound pressure (resistance to compression) than the stock shocks and I think that accounts for the � inch difference. The overall road manners were drastically improved. It corners much better with a much better feel of the road. Before installation the rear in would "skip" in turns with an uneven surface. It also would get jittery" hitting potholes and uneven pavement joints at highway speeds. All of that is corrected and the 4Runner is much more stable at high speeds and during evasive maneuvers. I am very impressed with the additional control this setup provides, and highly recommend it to anyone who wishes better road manners out of their Road Runner. If you decide not to install the springs, I would still install the Bilstein shocks. Due to some very "spirited" driving I overheated my brakes and cause the front disks to warp. I never really like the over all performance and feel of the stock brakes and wanted to change that. I ordered a set of TRD Carbon Metallic brake pads from TRD NW and a set of Power Slot gas slotted rotors from Performance Products. Installation was a snap and took about 40 minutes. It is very important that the wear in procedure is followed for the pads. I did notice right away that there was a drastic improvement in the braking. After a couple of days of wearing in the new brakes, I decided to see how well they did. In no uncertain terms,,, WOW! There is a big difference in braking performance. I can not say whether it is the pads, the rotors, or the combination that made the big difference. I am very happy with the new brakes. I have over 14,000 miles on them and I am still impressed. The TRD pads do generate more dust than the stock pads. I talked to Ron about it and he recommended a wheel cleaning product from Blue Coral called Self Clean Tire and Wheel Cleaner. I ran out to the store and got some. He is right, this stuff is great. If it is one thing that Ron knows about, it is how to keep a 4Runner clean. HOT TIP! The TRD brake pads are made by Performance Friction. You can get almost the same brake pads from Auto Zone for $36. Performance Friction part number 5024. The only difference is a slight change in the wear indicator on the inboard pad. This slight change was made so the TRD would have an exclusive only pad that no ones else could get. BIG DEAL. I just put these pads in my truck and they are the same thing and about half the price. The real nice thing is that Performance Friction gives a LIFETIME warranty so you never have to buy another set. When you wear them out you trade them in for brand new ones! Performance Friction entered into an exclusive marketing agreement with TRD. This gave TRD the exclusive marketing rights under their TRD label for the 4Runner/Tacoma applications. If you go to Auto Zone and ask for Performance Friction Carbon Metallic pads for the 4Runner/Tacoma you will find that there is nothing listed. They do have a listing for the 96 Land Cruiser. It is the pad that TRD sells for the 4Runner/Tacoma with only a small change in the wear indicator. I was told by the head guy at Performance Friction that the Land Cruiser pads will drop right into the 4Runner/Tacoma and it does. Ask for part number 5024 and if they ask what you are putting them in for the lifetime warranty paperwork, tell them a 96 Land Cruiser and you will be in good shape. TIP! 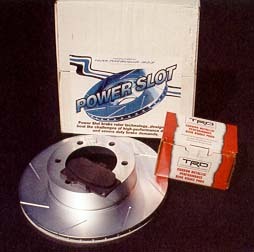 I really liked the slotted rotors, but they are more then twice the cost of OEM rotors. I also found that when they warp, they will warp again very soon after they are turned. I switched back to OEM rotors and I get them from Conicelli Toyota for about $50 each when I buy them 4 at a time. When they warp they go in the trash and I pop in a new rotor. I think in the long run I will save money this way. I installed a set of braided stainless steel brake lines from SMC Products (949-369-5223). The new brake lines give a firmer feel to the brake pedal over the stock lines. Steve at SMC covers the brake lines with a heat shrink covering in your choice of colors. 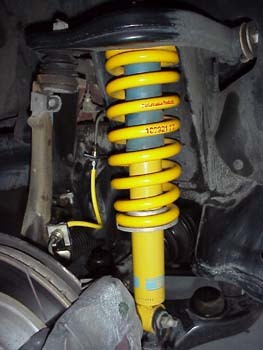 I chose yellow to match my springs and shocks. 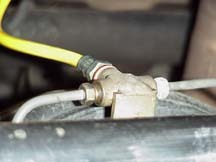 After installing the lines I flushed the fluid using a one man brake flushing kit. I helped Ron install his lines and we used the two man method to flush the brake fluid. It turned out so much better then mine, I went back and reflushed mine using the two man method. It turned out much better. So I recommend the two man method to flush the brakes. I wanted still better on road handling and ordered a set of Addco sway bars through TRD NW. They were on backorder for about eight months. Apparently Addco had some problems at their factory in Florida. The stock front bar is 1 inch and the Addco replacement is 1 1/4 inches. The stock rear bar is 3/4 inch and the Addco replacement is 1 inch. It does not sound like much of a difference, but it really makes a big difference in the way the 4Runner handles. The front bar can be easily installed while the vehicle sits on the ground. It took me about 40 minutes to install it, not hard at all. The rear one requires a lift so that the rear axle can be dropped enough to fish out to old bar and slip in the new one. TRD NW talked me into not using the bushings that come with the bars from Addco. They recommended that I get graphite-impregnated bushings from Energy Suspensions. I got the sway bar bushings and end link bushings. The sway bar bushings and brackets fit the front bar work just fine. You will need to replace the four bolts on the front bar brackets and they are not included in the Addco kit. You will need 4 bolts (8x1.5 x25mm), washers and nuts. The stock bushing clamps use captive hardware that can not be reused. 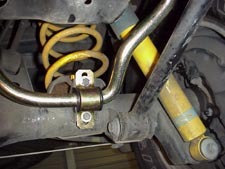 The Energy Suspension end link bushing can not be used on the front bar. 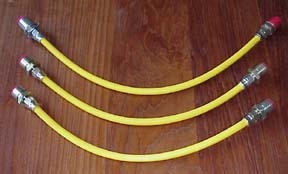 They are to thick and will not allow you to install the retention nut. 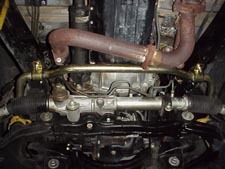 The Energy Suspension sway bar bushings can not be used on the rear bar because the holes in the brackets will not line up with the mounting hole in the rear axle. Overall the bars are a snap to install if you have a lift for the rear bar installation. I recommend that you just use the Addco bushings that come in the kit and dont spend the extra money on the Energy Suspension bushings. With a little work you can make the Energy Suspension bushings work if you just want to upgrade the bushings without upgrading he bars. The stock front bar ends are thinner and the Energy Suspension end link bushings will work with the stock bar. The Energy Suspensions rear bar bushing brackets will require some grinding to get them to fit the axle mounts. The new sway bars did for the handling what the TRD supercharger did for the performance. It is a substantial improvement. The truck corners absolutely FLAT. I have not been able to detect any bad manners that the sway bars may induce. I just can not describe how good my 4Runner feels when I drive it. It handles better than some of the so called "performance cars" I have driven. I highly recommend the Addco sway bar upgrade and I am very glad I waited all the time it took to get them.